Hours Before The Event: Predictions! It is past seven in the morning here in Barcelona and we leave for the MWC soon! Yesterday night all the bloggers part of the WOM World group including James from Nokia Creative, Norman from Symbian World, Mark from The Nokia Blog, Matthew from Darlamack, Stefanos from Pestaola, Amir from Phone Rush, and Neil from iGadget Life had somewhat of a jam session where we discussed our anticipations for tomorrow. 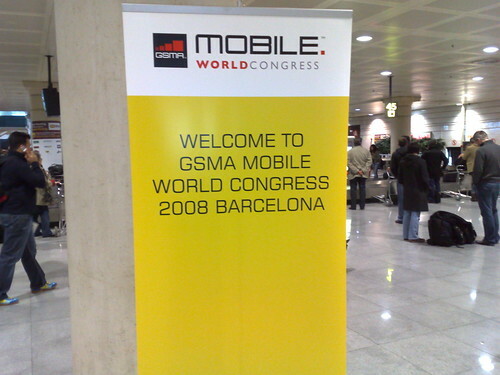 Some of it was caught on video and is there at the Mobile World Congress virtual event. – The N96 more likely than not. – There are rumours of an N78, I’m not too sure. – S60 Touch Demo – If its a proto I’ll be glad, but I’m not keeping my hopes high. – A couple of Eseries devices possiblly – E66, E71. – The new Maps Beta. – Anything other device will be a plesant surprise, Nokia surprise us! Need to leave now, or I might get late! Mark also has impressions from day one up, head over for a read! Even the airport is all set! I have my flight for Barcelona in a few minutes time! The next three days are probably going to be the most thrilling technology related days of my life and I am very excited. I need to stop here.. Check in soon! Will keep writing in the comments section as time goes on!